Cut the eye of round beef into strips with the fat on the outside. Lightly cover the meat with the rock salt and lay in a plastic container, place in fridge for about 15 – 25 mins. BRINE: In another plastic container pour in the malt vinegar and Worcestershire sauce. Add the sugar and the bicarbonate of soda to the brine. Mix well. Now pour the toasted coriander seeds into a processor and pulse, just enough to break the seeds in half and to make a little powder. You can also put the seeds in a ziplock bag and hammer them with a kitchen mallet to crush them. Remove the container with the salted steaks from the fridge and remove all the rock salt from each steak. The meat should be firm right now. Place all the steaks with the salt removed aside. Rinse out your first plastic container to lay your steaks in brine mixture. You have two plastic containers for brining. Now dunk all the steaks in the brine and lay them side by side there for 15 mins. Start removing each steak and squeeze each steak to remove liquid, there should still be a bit of liquid left in the steak. Don’t do them bone dry. Do this to all the steaks and lay them on a dry tea towel. Sprinkle each steak first with the coriander seeds then with the black pepper to taste. 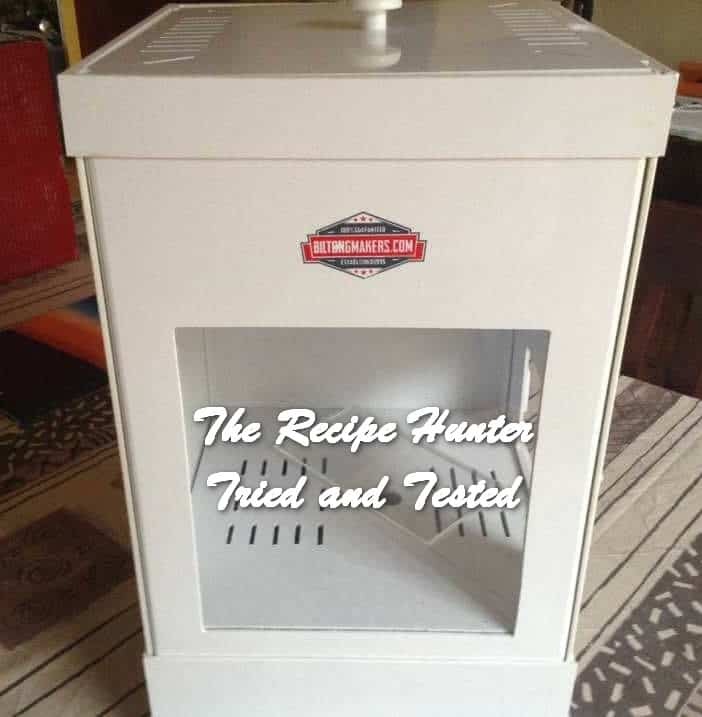 Now hang each steak in your biltong box or dehydrator. Make sure that the pieces do not touch each other. 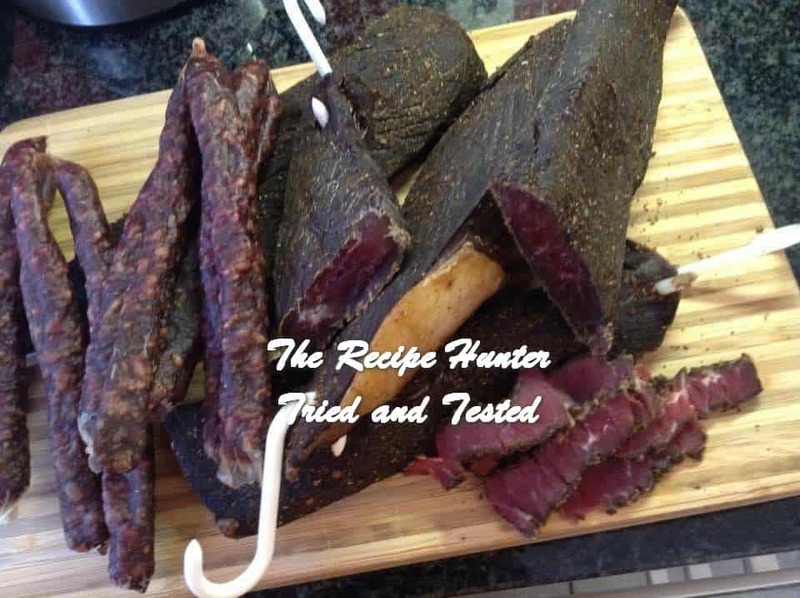 If you don’t have a biltong box you can use a fold up clothes hanger and have a fan blow on the meat. Let cure for 4 to 5 days. The longer you leave the pieces the dryer they will become. I prefer the meat to be a bit wet. You can also dry spicy sausage by draping them over the dhol sticks. They take about 4 days to dry out.